NextConstans: champion of the Trinity or enemy of Gaul ? 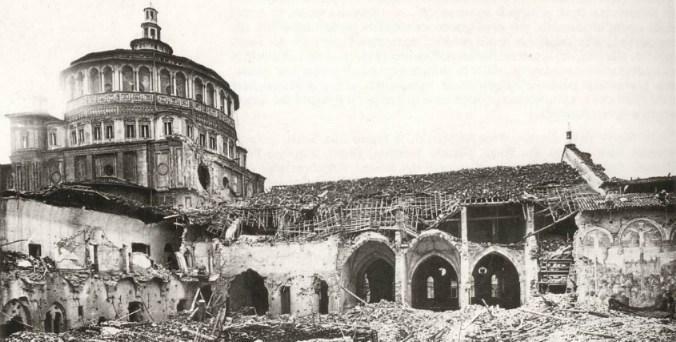 On the 15th August, 1943, bombing destroyed the great cloister of the Santa Maria delle Grazie monastery, but miraculously spared the three walls of the refectory, including the one with Leonardo Da Vinci’s famous ‘The Last Supper’. Was it a case of divine intervention or just dumb luck? Maybe we should thank the British and American air bombers for their bad aim? (It wasn’t until the US obliterated the monastery at Monte Cassino, Italy in February 1944, that US attitudes changed to the preservation of historical monuments and sites.) Nevertheless, it was the frantic efforts of the people of Milan, who helped stabilize and sandbag the painting against any further bombing splinters. Then, after the Second World War, the monastery was rebuilt with a ‘clean and stabilise’ resortation undertaken by Italian restorer and painter, Mauro Pellicioli between 1951 and 1953. It wasn’t the first time in its history that Da Vinci’s painting of the Last Super needed some love and care. Its last major restoration took placed between 1979 to 1999. 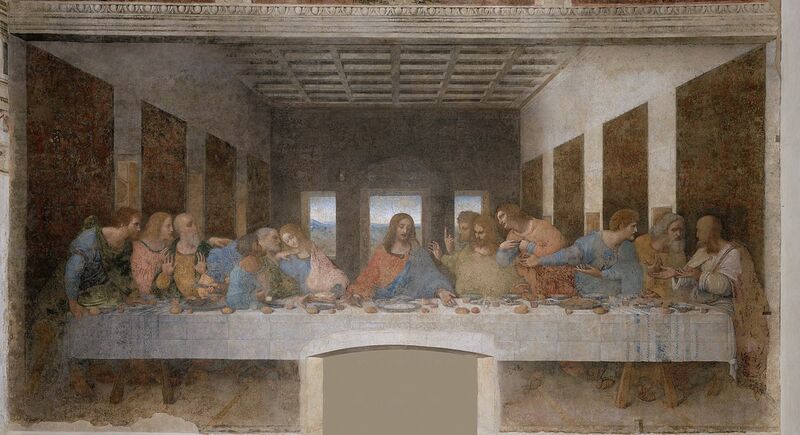 (The main source for the restoration was Giampetrino’s extract copy of The Last Supper which he copied in 1520. It includes lost details such as Jesus missing feet and the salt-cellar spilled by Judas. Giampietrino is believed to have been one of Leonardo Da Vinci’s pupils who worked closely with him when he was in Milan.) Today, the refectory wall that the painting sits on is sealed in a climate controlled room. Hopefully, generations of art experts, people and pilgrims can enjoy viewing the original for a few more centuries. 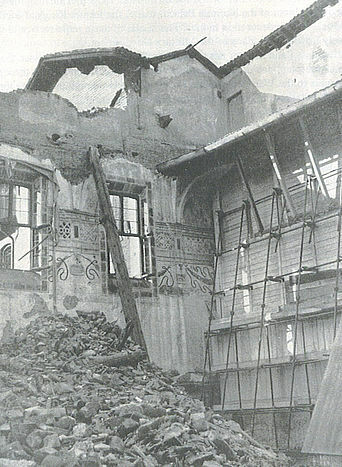 This is an image of what remains of the refectory of the Santa Maria delle Grazie monastery after the 15th August bombing. You can see the protective sheets that were assembled to protect the Da Vinci wall painting of the Last Supper. This is another view of the Santa Maria delle Grazia, in Milan, after the allied bombing on 15th August 1943. 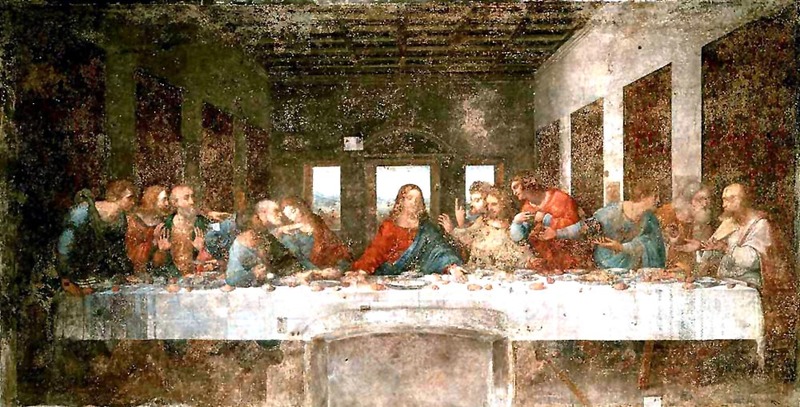 The Da Vinci ‘Last Supper’ was arguably within metres of being destroyed. 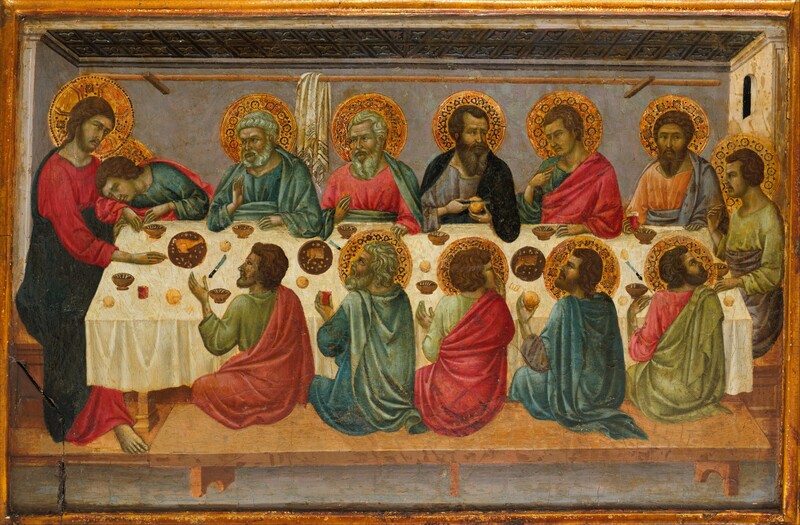 Da Vinci wasn’t the first to paint a Christian view of the Last Supper. This is Ugolino di Nerio’s The Last Supper circa 1325-30. Judas is the only one without a halo. Why is Da Vinci’s masterpiece so important that we feel obligated to preserve it generation after generation. Certainly, other great artists have painted the ‘last supper’ of Christ before, but arguably not quite like Da Vinci. His remarkable interpretation of Jesus sharing a meal with his disciples (in what is the first Eucharist where Jesus announces that one of them will betray him) shows everyone interacting with each other with amazing emotion. Furthermore, from an artistic or technical point of view, Da Vinci draws our attention straight to the centre of the painting with Jesus, before we scan with our eyes to see what is going on around him. Many have seen this, as the quintessential reason why preserving it is so important. Art and history at its zenith!? Whether Da Vinci painted it purely for financial reward or for a higher spiritual reason, it is frustrating to think, why didn’t he put more thought into it, in terms of making sure it would still be around for future generations to admire. Almost immediately after he had finished painting it in 1498, it began to flake off. Da vinci’s problem was that he was such an imaginative artist and inventor that he was always trying to invent the next best thing and remain one step ahead of his contemporaries. He tried coating the Santa Maria refectory wall with an experimental waterproof undercoat, which he believed would help him in his process of painting. Unfortunately, as already mentioned, it was a disaster. If we are to believe Leonardo Da Vinci’s biographer Giorgio Vasari, he describes the painting as ‘ruined’ and unrecognizable by 1556. Da Vinci’s painting as it looked in the 1970’s prior to its major restoration between 1979 and 1999. Da Vinci’s ‘The Last Supper’ after its major restoration works in 1999. Notice the undesirable doorway that was cut into the painting in 1652. We almost lost Da Vinci’s painting ‘forever’ on several other notable occasions throughout its history. The most notable being in 1652, when somebody thought it appropriate to insert another door to the refectory. Further mishaps saw restoration artists in the eighteenth unintentionally damage the painting by applying, removing and then re-applying oil paint and vanish. French troops in 1796 apparently threw stones at the painting chipping it and later even scratched out the eyes of the disciples. To add further insult to injury, another so-called expert tried removing the painting to a safer location before realizing he had damaged a major middle section of the painting. But don’t worry, he glued it back together! Finally, as mentioned, we came awfully close to losing the painting in 1943 during the allied bombings. Only around ten completed paintings by Da Vinci survive today. The Last Supper is one of them. 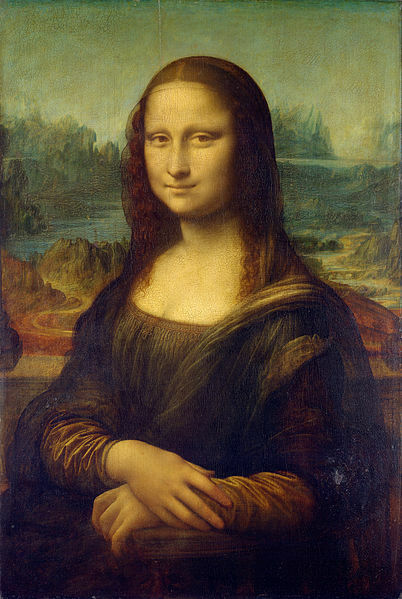 Though, there is also another one of his great works and arguably the most famous painting of all time that I would one day like to give some attention to: Mona Lisa. Thank goodness, he decided to use a more traditional method to paint her and so we don’t have to worry whether or not she will flake! But, Da Vinci and the Mona Lisa will be our focus for another day. The Mona Lisa. Da Vinci’s greatest work? Photo Credit: Every effort has been made to trace and acknowledge appropriate credit. The header image is The Last Supper, circa 1520, by Giovanni Pietro Rizzoli (Giampetrino). It is an exact, full-scale copy of Da Vinci’s painting. It is currently in the Royal Academy of Arts, London, collection. All other images are in the public domain too with the possible exception of the two images of the ruins of the Santa Maria delle Grazia, in Milan. The image of what remains of the refectory of the Santa Maria delle Grazie monastery is used under the ‘fair use’ rationale to highlight a unique historical moment in time. I believe that words alone cannot describe how close we came to losing Da Vinci’s famous painting. The 2nd image of the Santa Maria delle Grazia, in Milan, appears to be in the public domain with an expired copyright. I believe my inclusion of this image constitutes as ‘fair use’ to highlight a unique historical moment in time. It’s so horrible to think of all the art and architecture that was lost or almost lost during wars. I was able to visit the Last Supper a couple of years ago and it was great but the 15 minutes allowed for viewing were not nearly enough…. You are lucky!!! One day I will like to go and see this work of art!!!!! Very few people in this world can compete with Leonardo da Vinci for the title of The Supreme Genius of all ages. He is a true polymath and is regarded as a renaissance man. Just seen the painting for myself. Amazing experience! Da Vinci”s “Last Supper” survived WWII bombing by the incredible work of the Monuments Men who protected that masterpiece and others among the cultural heritage of Europe. The “David” was another entombed by their efforts for preservation. Inconceivable to imagine what could have been the destruction of so much iconic and irreplaceable art. Wow, I didn’t realize “The Last Supper” has been threatened so many times in its existence! Excellent article Robert, as always. The article has concluded that after many restoration attempts through the 20th century, especially after World War 2, “generations of art experts, people and pilgrims can enjoy viewing the original for a few more centuries.” I am hesitant to label the painting as an ‘original’ however, as the painting has been tampered with by restorers. As an artist myself, any changes to my artwork, even if they were damaged, would no longer be my original work. It may be considered an improvement or restoration, but it is nevertheless a change, and so cannot be considered original. If Da Vinci was able to witness these changes himself, then as an artist myself, I can assume that he would not have approved of these changes. Restoration has its pros and cons without a doubt. In regards to my comments about viewing the ‘original’ it was probably not the right choice of word. That said, while it is next to impossible to restore a painting to its ‘original’ state, restoration I believe can only see to its survival. Why wouldn’t you want to see it? Without intervention of any kind Da Vinci Last Supper would be lost forever. By the way, I don’t think it is in anyone’s interest to ‘tamper’ with artwork for the sake of it. Nowadays, at least, a great deal of thought is placed in conservation of art.